You might have gathered that Roger and Neil are music fans. 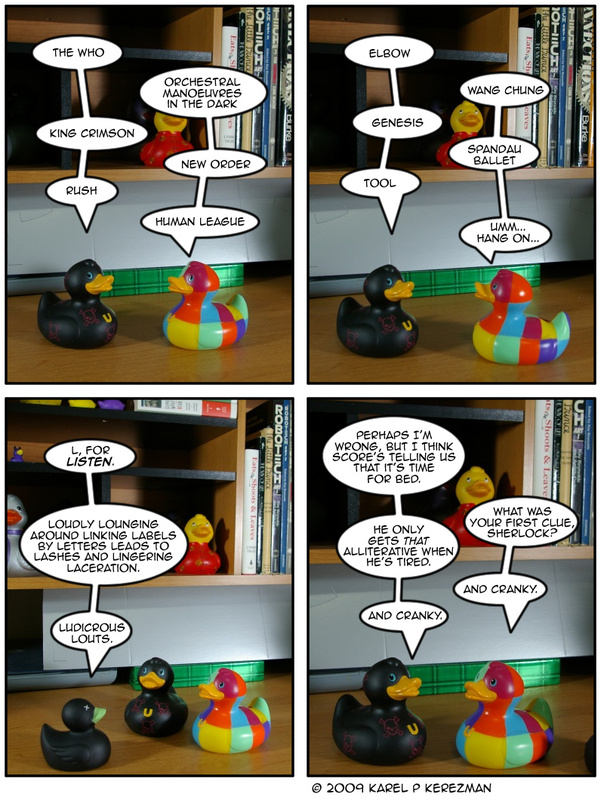 They also enjoy nimble wordplay, as do other denizens of the Quacked Panes crew. Okay, I was lazy and just used the last letter, not the last sound (or syllable), but hey. I stayed up far later than I should’ve to finish this comic as it is. You probably shouldn’t overthink this… like I just did. Ahem. How about “2 Unlimited”, then? Hah! I’d completely forgotten about that one. I approve, sir! It’s a sad, lonely life I lead. However, I’ve got one helluva music library. Dang it, knowing you’re in the process of development really plays havoc on my mind. Thanks for introducing me to Shiritori. I may have played something similar, in English. I look forward to playing this with friends, and especially my nieces and nephews. I really appreciate when entertainment is also educational, and even thought-provoking, while still fun.